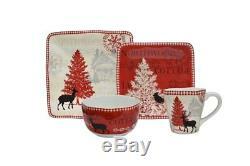 222 Fifth Christmas Tree 16-piece Square Dinnerware Set. Orange and violet flowers jump off of a turquoise background on these dinnerware pieces. The Calabria pattern by 222 Fifth brings a tropical feel to your home. 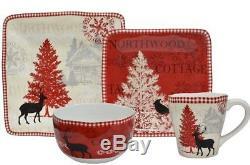 Made of 100% melamine, perfect for indoor and outdoor dining! Beautify your tablescape with this Calabria Mixed 12-Piece Dinnerware Set from 222 Fifth. This long-lasting durable melamine dinnerware showcases an attractive floral pattern, is dishwasher safe, and includes place settings for 4. ALL ITEMS ARE IN STOCK WHEN WE LIST THEM. Your message is handled in the order it is received and generally our response time is 24 hours. It is possible that your order will be sent out before your message is handled. Therefore, it not be possible to cancel your order. Changing your mind or finding an item at a lower price is not a valid reason for return. Feedback is extremely important to us. We can make you happy if you give us a fair chance. We cannot make it right unless we know about it. Leaving negative or neutral feedback does neither of us any good. The item "222 Fifth Christmas Tree 16-piece Square Dinnerware Set Service for 4 NEW" is in sale since Thursday, November 22, 2018. This item is in the category "Home & Garden\Kitchen, Dining & Bar\Dinnerware & Serving Dishes\Dinner Service Sets".seller" and is located in Vienna, Virginia. This item can be shipped to United States, Canada, United Kingdom, Denmark, Romania, Slovakia, Bulgaria, Czech republic, Finland, Hungary, Latvia, Lithuania, Malta, Estonia, Australia, Greece, Portugal, Cyprus, Slovenia, Japan, China, Sweden, South Korea, Indonesia, Taiwan, South africa, Thailand, Belgium, France, Hong Kong, Ireland, Netherlands, Poland, Spain, Italy, Germany, Austria, Bahamas, Israel, Mexico, New Zealand, Philippines, Singapore, Switzerland, Norway, Saudi arabia, Ukraine, United arab emirates, Qatar, Kuwait, Bahrain, Croatia, Malaysia, Brazil, Chile, Colombia, Costa rica, Dominican republic, Panama, Trinidad and tobago, Guatemala, El salvador, Honduras, Jamaica, Antigua and barbuda, Aruba, Belize, Dominica, Grenada, Saint kitts and nevis, Saint lucia, Montserrat, Turks and caicos islands, Barbados, Bangladesh, Bermuda, Brunei darussalam, Bolivia, Ecuador, Egypt, French guiana, Guernsey, Gibraltar, Guadeloupe, Iceland, Jersey, Jordan, Cambodia, Cayman islands, Liechtenstein, Sri lanka, Luxembourg, Monaco, Macao, Martinique, Maldives, Nicaragua, Oman, Peru, Pakistan, Paraguay, Reunion, Viet nam.